As a Catholic Christian, I enjoy our liturgical calendar. I see it as a path to follow–a guide to help me on my journey. For Catholics, the new year began on the first Sunday of Advent, November 30, and continues for three more Sundays. Advent is a time of preparation. In the scriptures we read, “A voice cries out in the wilderness, prepare the way of the Lord.” In church we sing, “Oh come, oh come, Emmanuel.” Through reflecting inwardly and reaching out to others with acts of mercy, we prepare our hearts to receive Jesus. Advent is followed by Christmas. For many people, Christmas is one day–December 25. For Catholics, Christmas is a season. It begins on December 25 and continues through Epiphany–January 4 this year. Epiphany celebrates the arrival of the magi and reminds us to always seek Jesus and keep him foremost in our hearts and minds as we travel on our journey. After the Christmas season, we move into what is called ordinary time. That doesn’t mean we sit back and relax until Lent. Strengthened in faith by our weeks of preparation, we move forward, following the teachings of Jesus and applying them to our daily lives. I have a magnetic sign I hang on my car this time of year. 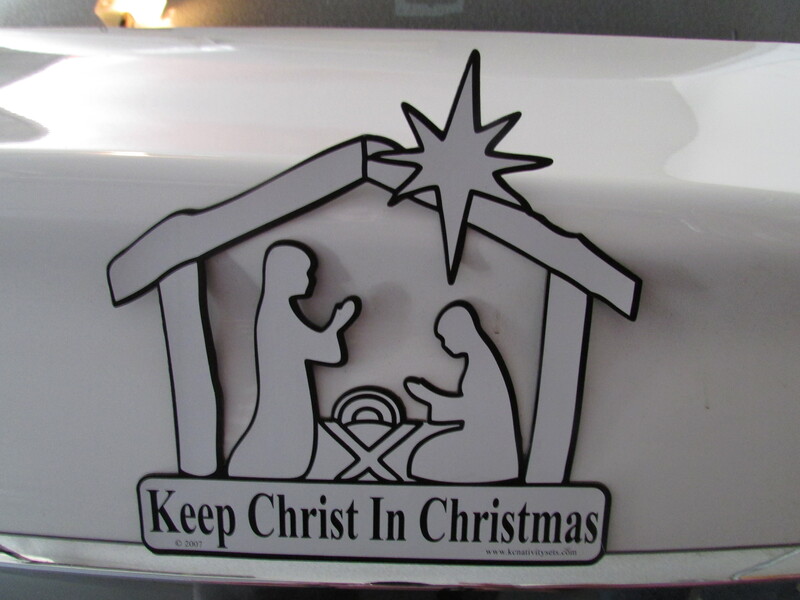 It says, “Keep Christ in Christmas.” More and more these days, the traditional greeting of “Merry Christmas” is being replaced by the more general and ostensibly more politically correct “Happy Holidays.” As Christians we have witnessed our celebration of Christ’s birth being overshadowed by more material and secular activities such as parties and shopping for expensive gifts. “Keep Christ in Christmas” has become a movement to remind us of the true meaning of the season. Ironically, the expression “Merry Christmas” seems to have taken on new importance as we boldly continue to greet others with those words. One of my favorite ways to celebrate Christmas is ringing the Salvation Army bell. This past Friday, I finished my third and final session–with temperatures in the twenties, bundled up from head to toe. I watched with glee as bills and coins were pushed through the slot into the red kettle, knowing that it all goes to help those in need in our community. But ringing the bell is about more than just collecting money. What I enjoy most is greeting people as they walk up to the store–receiving and returning their smiles and warm wishes. Sometimes I’m able to share a brief moment in someone’s day and I really love that. It makes me feel a part of something bigger than myself and lets me know that we are in this together. Keeping Christ in Christmas doesn’t seem like such a daunting task as I recognize him in the kindness and generosity of those I meet as I stand there in front of Safeway, ringing that bell.